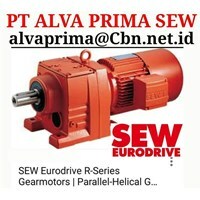 PT ALVA PRIMA SEW GEARMOTOREMAIL : ALVAPRIMA@CBN.NET.IDSEW GEAR MOTOR & SEW GEARBOXR..DR.. series helical gearmotorsMake use of the advantages of the compact combination of powerful helical gear units and AC motors. Our helical gearmotors of the series R..DR.. set themselves apart with their finely stepped gear unit ratios and variety.helical_gear_unit_rx_rm_series_800x450Energy-efficient: individually configurable helical gear unit with motorOur helical gearmotors of the series R..DR.. are universal all-rounders for many of your application areas. With their high efficiency, they are ideally suited for a multitude of applications.Thanks to our consistent modular system, the helical gearmotors of the series R..DR.. offer you many combination options.Regardless of the helical gearmotor design you finally decide on: You are always getting an optimum ratio between performance and intelligent use of space. Especially when you are looking for a space-saving drive solution.Even at the level of energy efficiency, the gearmotors of the series R..DR… offer you excellent product characteristics. This is particularly true for the AC asynchronous motors of the sophisticated efficiency classes IE3 and IE4.Make use of this high energy efficiency in your applications. The helical gearmotors of the series R..DR…come in either a foot or flange-mounted design making a range of assembly options possible. 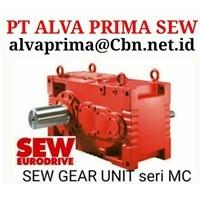 PT ALVA PRIMA SEW GEAR MOTOREMAIL : ALVAPRIMA@CBN.NET.IDIn six single-stage and fourteen two-stage and three-stage sizes, the helical gearmotors by SEW-EURODRIVE ensure an optimum ratio between power and space requirements.Your advantages High torque density Long service life R37 ... R167 Reduced backlash option RM series, specially designed for agitating applicationsThe tried and tested modular concept and our strict quality criteria allow SEW-EURODRIVE to provide a diverse range of torques and reduction ratios with incomparably finely tuned gradings. 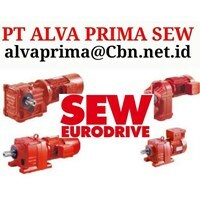 With this exceptional diversity, SEW-EURODRIVE sets new standards in the field of drive engineering.Available versions Single-stage or multi-stage Foot-mounted or flange-mounted Foot-mounted and flange-mounted Flange-mounted with extended bearing hubHelical Gearmotor R Series RX series (single-stage)For high output speeds, the exclusively single-stage gear units RX57 to RX107 offer compact solutions for your system design.Technical dataGear unit reduction ratio[i]1.30 - 8.65Output torque[Nm] ([in-lb])69 - 830 (610 - 7340)Motor power range[kW] ([Hp])0.12 - 45 (0.16 to 60)Helical Gearmotor R Series R series (two-stage and three-stage)Our complete range of helical gearmotors provides the optimum size and power solution for every drive task. And for applications where weight is an issue, our multi-stage gear units provide something special: Thanks to their die-cast aluminum design, the models R07, R17 and R27 are three particularly efficient lightweights – ideal as satellite drives and for use in light machine constructions. 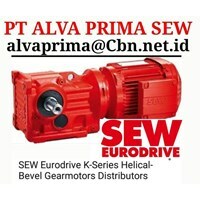 Reduced backlash helical gear units are also availableSEW-EURODRIVE is movement, tradition, innovation, quality, and service all in one. We prove this to our customers every day and have done so for the last 77 years. We do not just move countless conveyer belts, bottling plants, sports stadium roofs, gravel plants, assembly lines, processes in the chemical industry, your luggage at the airport, or even you on escalators. We also are moving ourselves. In our company, there is no such thing as standing still. Every day, nearly 500 researchers and developers are working to create the future of drive automation and make it a little better. Collectively, more than 12,000 employees around the world are moving to develop solutions that help you optimize your processes. 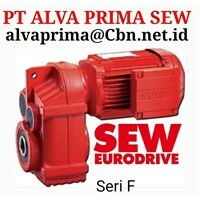 This is how SEW-EURODRIVE has evolved throughout its history to become the market leader in the industry of drive automation with a turnover of roughly EUR 1.8 billion. Wherever machinery moves - that's where you'll find SEW-EURODRIVE products and people hard at work driving US industry forward. In fact, our innovative power transmission solutions set the global standard in rugged, high-torque performance up to 450,000 lb-in. From the heaviest loads to the harshest environments, our applications specific solutions are engineered to deliver maximum reliability and efficiency - day in, and day out. "Think global, act local" has been our guiding business philosophy for many years. While the majority of SEW drive components are manufactured centrally to a single standard in our global production facilities, final assembly and custom modifications are performed in regional assembly plants located close to our customers around the world. This day-to-day contact with national and local markets is vital to our success. 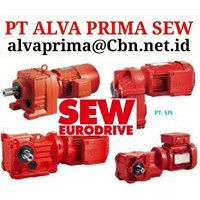 SEW-EURODRIVE brings together everything you need to drive performance for your systems. A superior family of products, unsurpassed engineering and technical support and innovative new technologies. 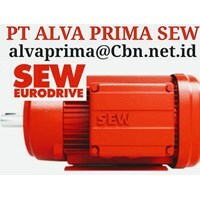 We invite you to experience the SEW difference.